SKUAST Kashmir Project Assistant and Field Assistant Jobs. SKUAST recently published the official jobs notification for posts Project, Field Assistant job. All the Interested candidates may send their applications on plain paper giving full details of academic qualification/research experience are invited for the contractual position of Project Assistant and Field Assistant. Jkalerts will provide you the complete detail about this J&K Govt job notification like Eligibility criteria, How to apply Online, Important dates, Age limit with relaxation, post by category, Selection process & official notification. So interested candidates are requested to read it carefully to apply for SKUAST Kashmir Project Assistant and Field Assistant job. 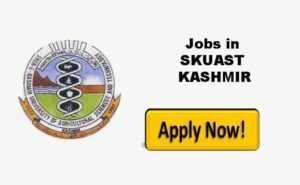 SKUAST Kashmir Project Assistant and Field Assistant Recruitment 2018. Applications on plain paper giving full details of academic qualification/research experience are invited for the contractual position of Project Assistant (01) and Field Assistant (01) under new DST Project entitled “Development of Innovative strategies for the management of Whitefly in vegetable Ecosystem of Kashmir”. Qualification Graduate in Agriculture/ Horticulture/Bio Science, Candidate having work experience /Knowledge of computer shall be preferred. Qualification 10+2 in any subject, Candidate having agriculture field /work experience shall be preferred. Salary @ Rs 8000/- per month fixed. Candidates may submit their applications along with relevant certificates to the concerned Principal Investigator by or before 27-08-2018 during office hours and may appear for interview along with original certificates and testimonials on 30th August 2018 at 11.00 am in the Division of Entomology, SKUAST-K. Shalimar, Srinagar. The emoluments will be given as per the funding agency and the position(s) is terminable with the completion of the project. For SKUAST- K Upcoming jobs notifications Selection Lists and Results update Free Job Alerts and Updates for both Fresher and Experienced Candidates. Keep Visiting Jkalerts.